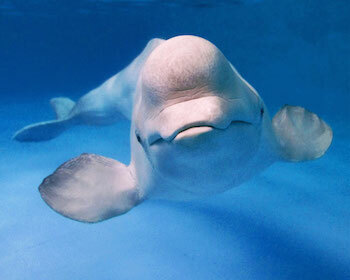 A beluga whale. Photo: Premier.gov.ru, CC BY-SA 4.0. Whales are under threat from all sides: whaling, the degradation of habitats, toxins in the water, the damaging effects of sonar, and climate change. There is also the very real danger of being struck by ships. To avoid whales, shipping crews need to know where they are. This is where Pythagoras' ancient theorem about right-angled triangles comes in: a simple application of the theorem can save whales! 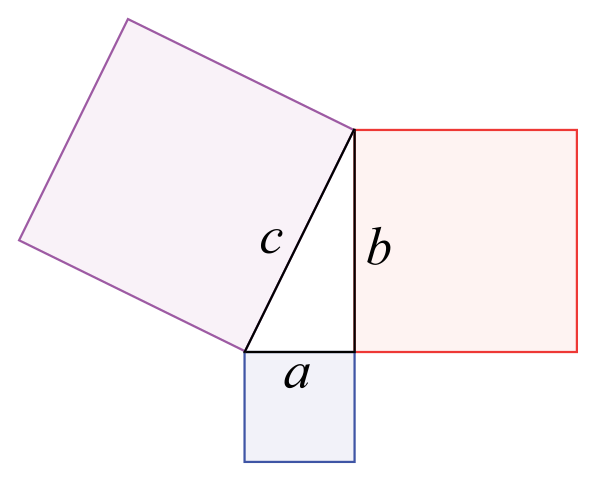 The theorem is named after the ancient Greek mathematician Pythagoras of Samos, who lived between 569 and 495 BC, although it was already known to the Babylonians before him. 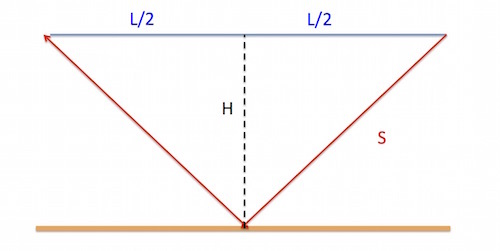 For some beautiful visual proofs of the theorem, see this article. 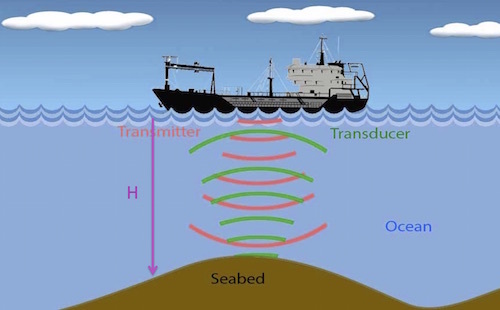 One very good way of locating fish and ships is active sonar, which involves sending out sound and listening to the echo. Whales, however, appear to hate the sound signals that are sent out. It confuses them and disrupts their behaviour; they have even been known to beach themselves to avoid the sound. The answer is, not to send sound out into the ocean, but to listen for the sounds emitted by the whales themselves — to listen to the whales sing. where is the speed of sound in seawater, around 1500 metres per second. Our task is to find . But how? The trick is to listen for two sounds: one that arrives from the whale directly and an echo of the sound from the sea bed. From this difference we will be able to work out the distance of the whale, but first we need to establish the depth of the ocean in the vicinity of the ship. This can be done using active sonar: send a pulse of sound directly downwards and listen for its echo. 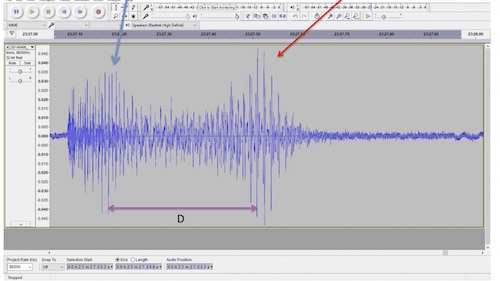 Below is a recording of the pulse and its echo, represented by their waveforms. The pulse itself is marked by the blue arrow and its echo by the red arrow. In the time it takes the pulse to travel to the sea floor and back, it travels a distance of where is the depth of the ocean. Since we can measure and know the value of we now also know the value of . Now let’s go back to Pythagoras’ theorem. By listening out for the whale’s song we can measure the time difference between the arrival of a pulse of sound coming from the whale directly and a pulse emitted at the same time, but being reflected off the sea floor. This is done by listening to a whole range of echos and exploit the regularity, using statistical techniques. 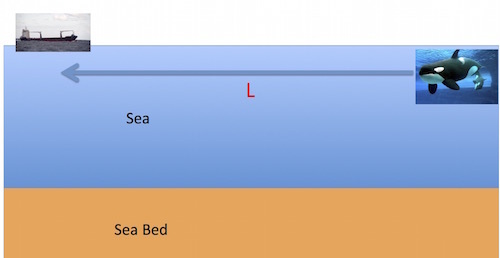 The location of the ship, the location of the whale, and the point at which the whale’s sound bounces off the sea floor form a triangle, which can be divided into two right-angles triangles as shown in the diagram below. Since we know both , , and , as well as the direction of the whale’s singing, we know exactly where the whale is. Changing direction, if necessary, we can save it from being hit. Chris Budd will give a talk about this subject at New Scientist Live in October 2019. Chris Budd OBE is Professor of Applied Mathematics at the University of Bath, Vice President of the Institute of Mathematics and its Applications, Chair of Mathematics for the Royal Institution and an honorary fellow of the British Science Association. He is particularly interested in applying mathematics to the real world and promoting the public understanding of mathematics. 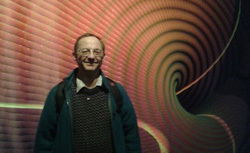 He has co-written the popular mathematics book Mathematics Galore!, published by Oxford University Press, with C. Sangwin, and features in the book 50 Visions of Mathematics ed. Sam Parc.